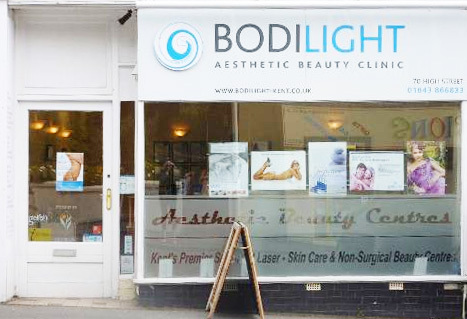 We are always happy to hear from you at Bodilight, whether you have an enquiry, suggestions, or feedback. We’re on hand to discuss the best way forward for you concerning your beauty treatments. Don’t forget our handy FAQs on each treatment page too. We’re constantly updating them with useful questions and answers from our customers. You can also use the form below. Simply fill out the form and someone will get back to you at the earliest convenience. If you’re contacting us to discuss an appointment we recommend you call us on 01843 866833. We look forward to hearing from you. Parking available in public car park behind the clinic.